Simply rotate the body of meter to get an unobstructed view of the LCD display! 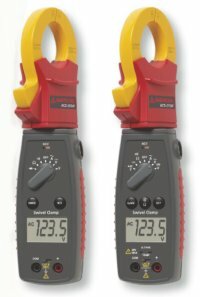 Rich set of features and CAT III 600V safety reading for use in electrical and HVAC applications. Measures AC Current up to 400 ACA, AC/DC Voltage up to 600V, Resistance to 40M Ohms. Display: 3¾ digit liquid crystal display (LCD) with a maximum reading of 3999. Overrange: (OL) or (-OL) is displayed. Low battery indication: The “ “ is displayed when the battery voltage drops below the operating level. Auto power off: Approx. 10 minutes. Operating Environment: 0°C to 50°C / 32°F to 122°F at <70% relativehumidity. Storage Temperature: 20°C to 60° / -4°F to 140°F, 0 to 80% R.H. with battery removed from meter. Accuracy: Stated accuracy at 74°F ±8°F, <75% relative humidity. Jaw opening capability: 30mm (1.18 in) conductor. Power: 1.5 volt battery x2, R03/SIZE AAA. Non-Contact Voltage Indicator: Sense voltage 70V to 600VAC (50Hz ~ 60Hz) beeper chirps and big bright red LED comes on, works when meter dial is on any ranges. Temperature Coefficient: 0.1 × (specified accuracy) per °F, (32°F to 66°F, 82°F to 122°F).